In the FY 2017 the Optical Neuroimaging Unit continued several imaging projects. 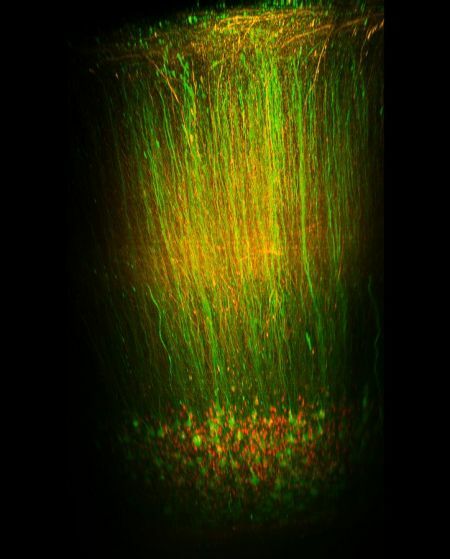 Most research projects focused on imaging neuronal activity in the mouse brain. Spatio-temporal maps of dendritic signalling and their relationship with somatic output is fundamental to neuronal information processing, yet remain unexplored in awake animals. Here, we combine simultaneous sub-millisecond voltage and calcium two-photon imaging from distal spiny dendrites, with somatic electrical recording from spontaneously active cerebellar Purkinje neurons (PN) in awake mice. We detect discrete 1-2 ms supra-threshold voltage spikelets in the distal spiny dendrites during dendritic complex spikes. Spikelets and their calcium correlates are highly heterogeneous in number, timing and spatial distribution within and between complex spikes. 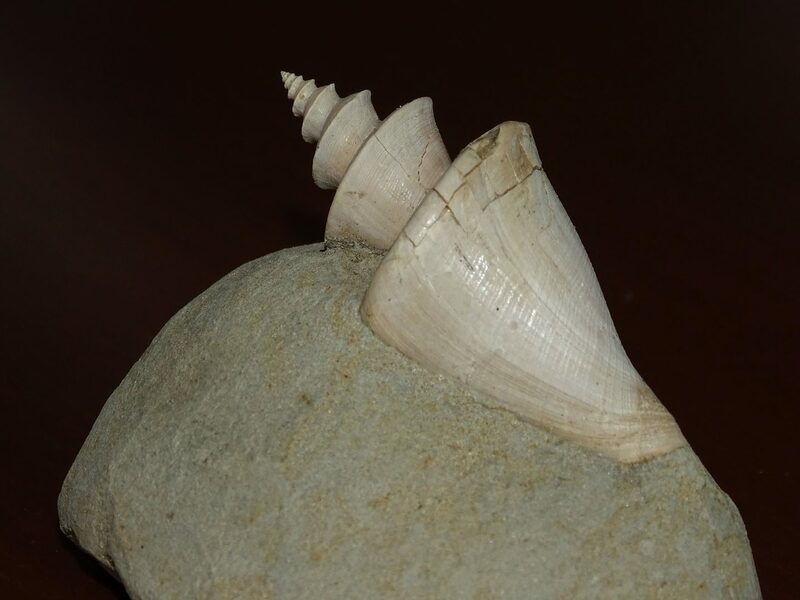 Back-propagating simple spikes are highly attenuated. Highly variable 5-10 ms voltage hotspots are localized to fine dendritic processes and are reduced in size and frequency by lidocaine and CNQX. Hotspots correlated with somatic output but also, at high frequency, trigger purely dendritic calcium spikes. Summarizing, spatio-temporal signalling in PNs is far more complex, dynamic, and fine scaled than anticipated, even in resting animals. Figure 1 A single Purkinje neuron was filled with ANNINE dye through a pipette at the cell body (top). A typical neuron has a cell body with many tree-shaped processes called dendrites, and a long cable-like process called the axon. The dendrites receive inputs, process information and pass it to the cell body. When a Purkinje neuron receives strong input, the entire dendrite gets activated (upstrokes in red trace) and the calcium ions flow into the neuron (transients in green trace). The voltage signals are 10-100 times faster than the variations in calcium levels. Figure 2 Spatially and temporally resolved map of a Purkinje neuron dendrite. Every red hotspot indicates an input to the dendrite. The red lines indicate activation of the full dendritic tree. Layer 1 in somatosensory cortex receives large quantities of cortico-cortical axonal innervation on distal dendrites of layer 2/3 and layer 5 distal dendrites of pyramidal neurons, theorized to exert gain control in the context of attentional focusing. Despite its importance, layer 1 has been difficult to study, as electrodes cannot focus on it. Here, we use two-photon microscopy for simultaneous bulk voltage and subcellular calcium imaging in somatosensory cortex of the mouse to study sensory responses during a standard stimulation, and during an oddball experiment. The technique allows depth resolved voltage measurements of average membrane potentials and dendritic calcium transients. Layer 6 (L6), the deepest lamina of cerebral cortex, is one of the key structures regulating behavior state related information processing within cortex and various subcortical areas. However, very little is known about the functional significance of different L6 circuits in vivo. In this project, we focus on primary visual cortex L6 feedback projections to visual thalamus (dorsal lateral geniculate nucleus, dLGN) which regulate visual signal transmission from retina to cortex. We perform calcium imaging of retrogradely marked L6 corticothalamic (CT) neurons with 2P microscopy in a head-fixed Ntsr1-cre mouse. 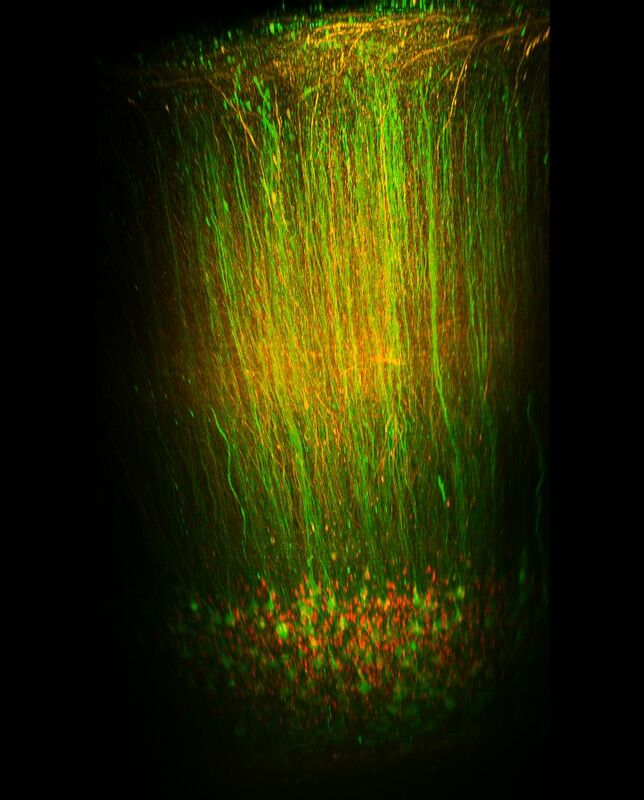 We record neuronal activity from the same neurons for several hours and / or repeat during different days while presenting visual stimuli and monitoring the activity of a mouse. In this way, we can study the corticothalamic feedback during different behavior states, ranging from full alertness to sleep. Figure 3 Reconstruction of Layer 6 neurons. One of the most exciting modern hypothesis in neuroscience is that astrocytes respond to neuronal signals with fast (<500ms) calcium transients that in turn can influence neuronal activity. However, it is controversial whether astrocytes respond reliably to neuronal signals in vivo. We developed a method that allows us to simultaneously record the activity of cortical astrocytes and thalamocortical axons at high contrast in the awake mouse. The method exploits the poorly characterized anterograde trans-cellular transfer properties of adeno-associated viruses (AAVs). We found that AAVs can transfer via axons to both neurons and astrocytes. This property allows us to express genetically encoded calcium indicators in axons and sparse contacting astrocytes and image their interactions with two-photon microscopy through a cranial window. We are investigating how different behavioral states (i.e. whisker stimulation, running, resting, sleeping, stress) influence the communication between axons and astrocyte microdomains in the somatosensory cortex of mice. Our findings challenge the spatial specificity of AAVs and allow us to record astrocyte-neuron interactions at high contrast under physiological conditions. Protein kinase A (PKA) is an important enzym in the signaling cascade connecting neuronal activity and expression and modulation of proteins. We use genetically encoded indicators to image PKA activity in vivo. Despite a broad research focus on the diverse symptoms of post-traumatic stress disorder (PTSD), the gradual emergence of symptoms following trauma exposure remains as a major conceptual challenge. I identified and examined behavioral development in mice isolated after observing a traumatic event inflicted upon their pair-housed partners. Compared to mice isolated without traumatic experience, traumatized mice displayed stractural changes in the forbrain. Fine-scale behavioral analysis showed that anxiety-related reactions gradually increased through isolation, while the early phases were independent of acute stress reactions. Instead of social avoidance, traumatized mice presented long-term social apathy to strangers. These behaviors were not observed if the traumatic event happened to strangers. Additionally, traumatized mice showed rebound responses to their partners after a long separation. Concluding, a single common factor, affectional bonding, underlies the rather independent development of PTSD-like behaviors in mice. The observed psychological homology between mice and humans emphasizes the potential of rodent models to untangle subtle psychobehavioral development in humans. Despite as a well-known nature that animals outside from any behavioral task display irregular organization of spontaneous behaviors, the underlying neuronal and behavioral associations remains unclear. We approach this challenge by investigating neuronal population activities across cerebral cortical layers and areas using two-photon calcium imaging in head-restrained mice. The data characterized distinct dynamic features of neuronal population activity embedded in their region-specified static features. With the dominant representation of behavioral state, temporal encoding of behavioral dynamics varied along multiple aspects of a single population-level dynamical process. By testing predictive power for future behavioral and neuronal states, the results demonstrate an open-loop control for movement generation and termination and a close-loop control for ongoing movement. Concluding, two distinct control mechanisms of neurobehavioral association are employed in producing dynamic patterns of spontaneous behaviors. Protein crystals are nanoporous materials. Despite this important characteristic, little is known about the conditions in the pores, also called channels. Here, we describe a method to study the calcium concentration and pH in the nanopores of thaumatin and lysozyme crystals. We load the crystal nanopores with fluorescent indicators and then perfuse the crystals with solutions of different calcium concentrations and pH while reading out the crystal’s fluorescence intensity with confocal microscopy. By calibrating the fluorescence signal we can determine the calcium concentration and pH in the nanopores. For the pH in thaumatin nanopores measured with the ratiometric pH sensor SNARF-1 we find a -0.7 pH shift compared to the bath pH corresponding to a 5-fold higher proton concentration. This is similar to the -0.3 pH shift found in lysozyme nanopores. With single-wavelength probes we find that the calcium concentration in thaumatin crystal nanopores is the same as in the bath while it is 0.24 times lower in lysozyme nanopores. 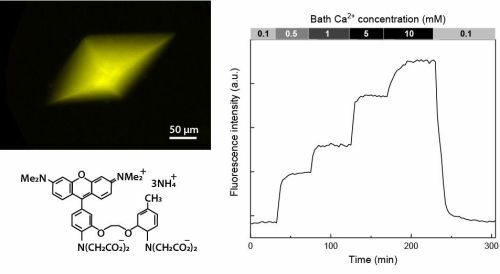 Summarizing, our experiments show that calcium concentration and pH in the nanopores of protein crystals can deviate significantly from that in the bath. In general, the described method can be applied for testing a wide range of ion or small molecule concentrations in transparent nanoporous materials not only with ratiometric but also with single wavelength fluorescent indicators. Figure 4 Protein crystals can be labeled with synthetic calcium sensitive fluorescent dyes (left). This allows measuring the calcium concentration in the nanopores of protein crystals. Sigita Augustinaite (2018) Complementary V1 layer 6 corticothalamic feedback encodes behavioral state. Seminar at Padua Neuroscience Center, University of Padua, Padua, Italy. Invited by Prof. Stefano Vassanelli. B. Kuhn (2018) Simultaneous dendritic voltage and calcium imaging and somatic recording from Purkinje neurons in awake mice. Seminar at Padua Neuroscience Center, University of Padua, Padua, Italy. Invited by Prof. Stefano Vassanelli. S. Augustinaite, B. Kuhn (2018) Complementary V1 layer 6 corticothalamic feedback encodes behavioral state. Gordon Research Conference “Thalamocortical Interactions: Development, Function and Dysfunction of Thalamocortical Networks”, Lucca (Barga), Italy. 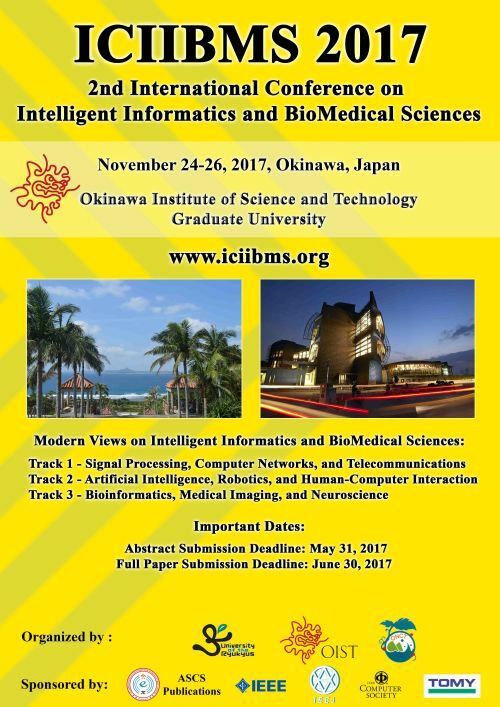 The Second International Conference on Intelligent Informatics and BioMedical Sciences (ICIIBMS) is in the planning phase. 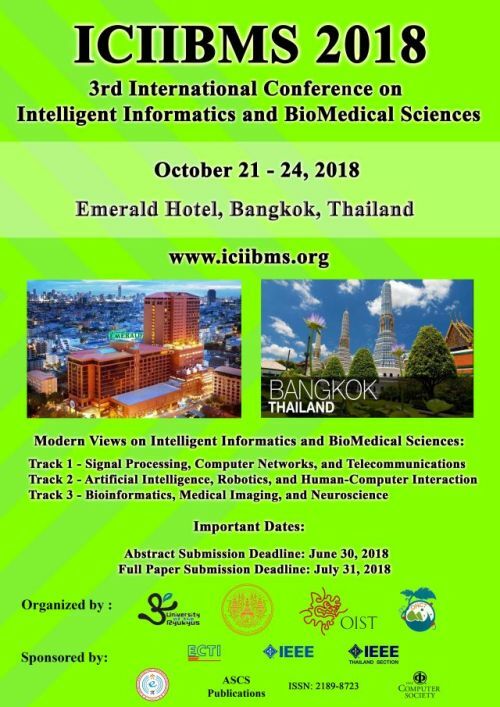 The Third International Conference on Intelligent Informatics and BioMedical Sciences (ICIIBMS) is in the planning phase.